L'appartato, gated community nota come Monterey Dunes Colony offre questa casa di lusso per il vostro piacere. La casa offre 4 BR e 3 1/2 BA situati in 2.500 piedi quadrati di superficie abitabile su due livelli. Due ponti sulla casa, non Oceanside e Oceanside. Questa lussuosa casa dispone di: un caminetto a legna (legna da ardere arredata), WIFI gratuito, TV satellitare, lettori DVD Bluray, stereo CD / radio (connessione Ipod-Iphone), quattro televisori a schermo piatto (due web abilitati), cucina completa, due frigoriferi , smaltimento, lavastoviglie e microonde. Culla portatile / box, più seggiolone per bambini. Due box auto, lavatrice e asciugatrice sono arredate con la casa. Il complesso in cui si trova la casa è recintato. Ci sono quattro campi da tennis, piscina, vasca idromassaggio, campo da basket, campo e campo pratica putt, campo di bocce e campi da shuffleboard. Lusso per otto, capacità massima di nove. Servizi: Outdoor Comunità spa, piscina, quattro campi da tennis, Weber griglia a carbone, Pitch and Putt, campo da basket, Bocce Corte, Shuffleboard Court, cucina completa, televisori, Satellite, Blu-ray lettore DVD, lavatrice / asciugatrice e lavastoviglie, stereo / CD / radio / lettore iPod / iPhone, garage camino, due auto, completamente arredati, lenzuola e stoviglie / utensili. Venti campi da golf a meno di 20 miglia, tra cui famoso Pebble Beach, così come i collegamenti a Spanish Bay, Cipresso, Poppy Hills, Black Horse, Baionetta e Rancho Canada. Attività: Nulla si può fare in spiaggia si può fare qui. Nuoto, canottaggio, pesca, kayak, pattinaggio, trekking, bird watching a Elkhorn Bird Sanctuary, correre, andare in bicicletta, smarriti sulla spiaggia, surf, snorkeling, immersioni e vela. Area: Monterey Bay è la posizione del Monterey Bay Aquarium, Laguna Seca Race Course, Pebble Beach, 17-Mile Drive, National Steinbeck Center, Carmelo e Cannery Row. I bagni sono dotati di porte larghe 28 pollici, troppo strette per ammettere molte sedie a rotelle. Piscina riscaldata da Pasqua a ottobre, bagno non accessibile con sedia a rotelle se oltre 28 'ampia. Legna da ardere è fornito, carbone per la griglia non è. Asciugamani di carta, sapone liquido, carta igienica e fazzoletti di carta fornito. 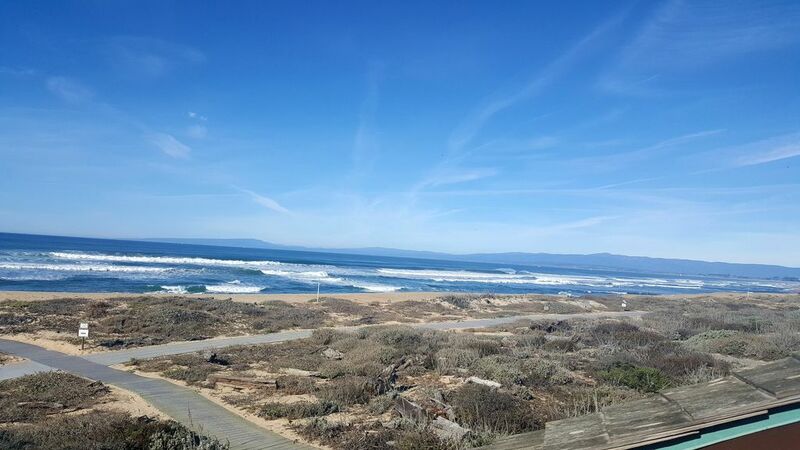 Very nice space in gated community with amazing views of the entire Monterey Bay. Clubhouse with pool, hot tub, tennis and bball courts and putting green with golf practice net. Well stocked kitchen, nice Weber grill and large wood fireplace with plenty of wood. Make sure you stock up on your way in as there isn't much in nearby Castroville or Moss Landing, but Marina and Seaside are not too far. Thoroughly enjoyed this place and would highly recommend for families looking to escape with a gorgeous ocean view every minute. We loved our time. Thank you Elizabeth for sharing your wonderful home! We had a wonderful family reunion over the holidays. December weather was great for kayaking at Elkhorn Slough, a very short drive away, and long walks on the beach, right out the back door. We mostly cooked in, and really loved the kitchen. It has EVERYTHING. Would definitely come back. We had an incredible 4-night stay at the Crown Jewel while we were attending a family wedding in Monterey. The house is exactly as pictured and the master suite upstairs was perfect! We left the window cracked every night so we could fall asleep to the sound of the waves crashing on the shore. The beds were comfortable, there was plenty of seating for the six of us to eat together and sit and talk and enjoy a glass of wine. We even spent some time over at the pool and hot tub. While we didn't need two refrigerators as most of our meals were elsewhere, it's nice to have that option for families enjoying more time at the house. I had to call Liz several times asking for help - things that had nothing to do with the house, but were our goofs (leaving needed medication at our previous address and locking ourselves out of the house - duh!). Liz couldn't have been more responsive and gracious - and that was so helpful to me during a stressful day of travel and arrival. But once we settled in at this house, our stress melted away and we felt such awe watching the sun set over the ocean. So if you want to stay at a beautiful home in an absolutely gorgeous setting, this is THE place to stay! Beautiful tranquil location. Would definitely return. Wife and 4 and 6 year old boys had a blast. Loved it. So quiet and peaceful. House was very nice and perfectly accommodated our young family. Would definitely recommend and return myself. This condo is exquisite!! The view of the crashing waves is incredible. I really loved the Crown Jewel, everything that you need to make your stay comfortable is available within the condo (kitchen supplies, hair dryer, towels, etc). All you need to bring is yourself and your friends. Would gladly stay here again!! Venti campi da golf in 20 minuti, Monterey Bay Aquarium, Cannery Row, Pebble Beach, Carmel. $250-$900/Night, dependent upon season and day of the week. Monterey County Hotel tax (10.5%) not included One-time cleaning fee of $195 for The Crown Jewel. 7 night minimum over Thanksgiving and Christmas - holiday rates apply.